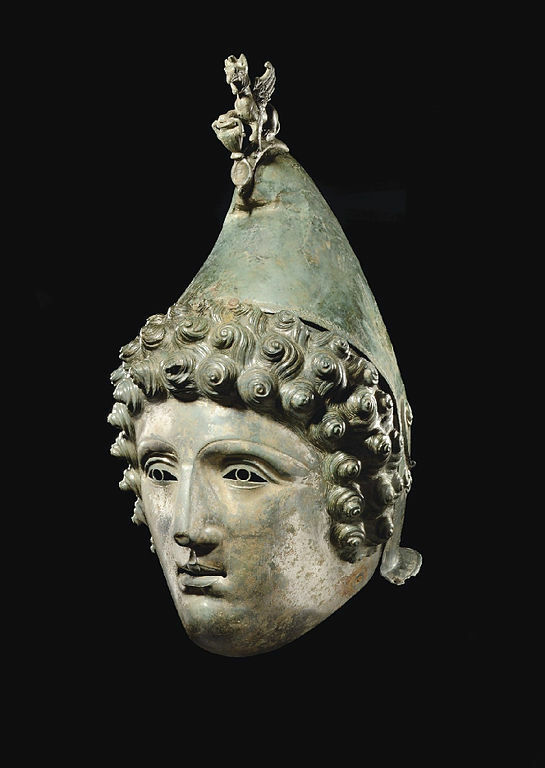 The Crosby Garrett Helmet is a copper alloy Roman helmet dating to the late 1st to mid 3rd century AD. It was found by an unnamed metal detectorist near Crosby Garrett in Cumbria, England in May 2010, close to a Roman road, but a distance from any recorded Roman settlements. Portable Antiquities Scheme, London, England, via Wikimedia Commons. The UK’s Department for Digital, Culture, Media and Sport announced plans to modify Britain’s 1996 Treasure Act to “allow more artefacts to be acquired by local and national museums and put on public display.” The changes include classing objects worth over £10,000 as Treasure, regardless of the material of which they are made. Britain’s ancient common law of treasure trove gave the Crown all finds of gold or silver that had been deliberately hidden, where the original owner intended to return and collect it, but could not be found. Britain’s 1996 Treasure Act modernized the common law: it required finders to report gold and silver objects over 300 years of age, for which no one claimed ownership. The Treasure Act also made finders and landowners eligible for a reward if objects went to a museum. 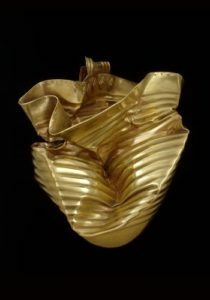 The proposed changes to the Treasure Act were prompted by an extraordinary number of large and important finds in recent years, including objects that were exceedingly valuable, but which did not fit the law’s definition of treasure, which still rested on old-fashioned notions about treasure meaning gold and silver. One such found object, an exceptionally fine 1,700 year old Roman era bronze helmet was found by a metal detectorist in 2010. Because the helmet was made of a copper alloy it could not be considered Treasure under the law and was sold to a private buyer for 2.3 million pounds. Government officials say that the scheme’s success requires changes to be made. The UK earlier required metal detectorists to report finds, but compliance was low. By incentivizing reporting through PAS, the number of reported Treasure finds had increased 1500% and a more efficient process was needed to manage them. Gold cape. 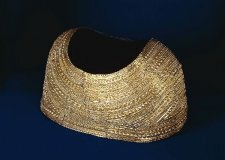 The cape is one of the finest examples of prehistoric sheet-gold working and is unique in form and design, made from single sheet of beaten gold. Circa 1900 BC – 1600 BC. Mold, Flintshire, Wales. PAS BM 1836,0902. According to the publication by the Department for Digital, Culture, Media and Sport, “Revising the definition of treasure in the Treasure Act 1996 and revising the related codes of practice,” while the vast majority of metal detectorists and other who find archaeological materials are in compliance with the law, a few “unscrupulous” individuals fail to report and sell items in online venues. Under the existing law, they cannot be sanctioned. Since officials believe that the current law is being followed, the proposed amendment to require a permit for all digging by professional archaeologists as well as amateurs and metal detectorists could add significantly to the government’s administrative burden and discourage the thousands of hobbyists who have voluntarily contributed data to the PAS scheme, without hampering the “unscrupulous” individuals who would likely fail to apply for a permit in the first place. The government is seeking commentary from individuals and organizations interested in the treasure process, including but not limited to “archaeologists, coroners, curators, Finds Liaison Officers and metal detectorists.” Comments will be accepted until April 30, 2019. The survey can be answered online, by downloading the form, or by email. Commenters will find the written report very useful and should review them first. In addition, the government suggests that commenters read The Treasure Act 1996: Code of Practice. For questions, the contact address is treasure@culture.gov.uk. Any metallic object, other than a coin, provided that at least 10 per cent by weight of metal is precious metal (that is, gold or silver) and that is at least 300 years old when found. If the object is of prehistoric date it will be Treasure provided any part of it is precious metal. Any group of two or more metallic objects of any composition of prehistoric date that come from the same find. Two or more coins from the same find provided they are at least 300 years old when found and contain 10 per cent gold or silver (if the coins contain less than 10 per cent of gold or silver there must be at least ten of them). Any object that would previously have been treasure trove, but does not fit the categories above. This would be objects that are less than 300 years old, that are made substantially of gold or silver, that have been deliberately hidden with the intention of recovery and whose owners or heirs are unknown. The UK’s Department for Digital, Culture, Media and Sport published its proposed changes as a Consultation that includes the survey questions for the public. The stated aim of the Act is to preserve significant finds for public collections. The proposed changes are to make the treasure process more efficient and rational – and to ensure that a workable system exists for the future. Adding a regulation applying in England and Wales similar to the one pertaining already Northern Ireland under which archaeological digging of any sort (both by professional archaeologists and others) is only allowed by permit. The Act would change the date to which the Treasure Act applies from 300 + years old sliding date to pre-1714, the date that the first Hanoverian king, George, came to the throne. A second class of Treasure would be objects that meet the age criterion (i.e. are at least 200 years old when found) and have a value of over £10,000. Changing archaeological objects of any material to Treasure means that a found object becomes Crown property. However, a reward would still be paid based upon its market value. Another class of Treasure would be single gold coins dated between AD 43, the beginning of the Roman period, and 1344, the year that Edward III successfully re-introduced English gold coinage. 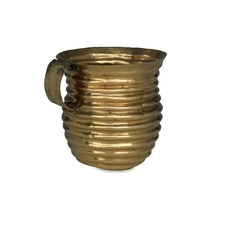 Inclusion of base-metal Roman objects as Treasure if two or more are found in a closed deposit. Creating a duty on a person who acquires a find that they reasonably believe to be treasure to report it to the coroner. This would create a criminal offense of failing to notify the coroner where a possible treasure finds has been acquired and there has been no investigation. The finder has a duty to report possible treasure within 14 days where there are reasonable grounds to believe that an article is treasure. The inquest process would be simplified, especially if no museum expressed an interest in the object(s). Placing narrow time limits for museums to express an interest (28 days), hold off inquests until time for interest has passed, for interested parties to provide further information on valuation (28 days after parties are informed of provisional valuation). Other changes are practical measures, such as that the Treasure Secretariat should screen lower value finds to avoid situation where cost of valuing the finds averages £115 per find, but in some cases the valuation is only £5 or £10. 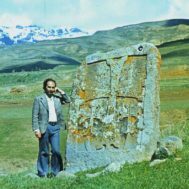 With enactment of the Portable Antiquities Scheme, or PAS, almost twenty years ago, the UK established a system that benefited both finders of objects and archaeologists. Every find is photographed, digitally recorded, and made publicly available on the PAS online database so the data is a valuable educational and research resource. The PAS set rules for notification and documentation, gave government archaeologists the ability to excavate finds, and supported the Treasure Act by increasing opportunities for museums to acquire archaeological finds for the public benefit. The PAS’s publicly available databases houses well over a million objects. Under the current system, if someone discovers archaeological objects, it must be reported to a local Finds Liaison Officer and a Report is made. Then it is offered to the local museum for acquisition. If a museum does not want it, then it is returned to the finder. If it is deemed to be treasure, then it becomes the property of the Crown. Objects are not purchased by museums, but a valuation is placed on the object for establishing a reward to the finder. First an independent expert valuer and then a Treasure Valuation Committee at the British Museum will value it. An invoice is issued to the British Museum and payment is supposed to be made to the finder within 4 months. Past PAS finds included The Frome (Somerset) Hoard of 52,503 coins, a hoard hidden in 290 AD, one of 500 Romans coin hoards discovered since the PAS scheme began in 1997. PAS data has been used in hundreds of research projects, including about 100 PhDs. It also encourages active public involvement in archaeology. Community-based volunteers assist in recording finds, in events and exhibitions to raise awareness of the educational value of archaeological context, and promoting protection of the local historic environment. The UK’s Department of Digital, Culture, Media and Sport has urged all interested persons and organizations to weigh in with comments on the proposals. With its Portable Antiquities Scheme, and the Treasure Act, the UK has developed the only functional and eminently successful system in the world for bringing amateurs and hobbyists, professional archaeologists, historians treasure hunting metal detectorists, and the communities together to document and preserve sites and finds for the public benefits. It is a positive model for preserving heritage around the world. If success has brought out practical and legal elements of the scheme that need improvement, changes may result in an even better and more workable model for the future.